The other day, I went to a French restaurant in Tokyo. Look at this! Isn’t it so beautiful? 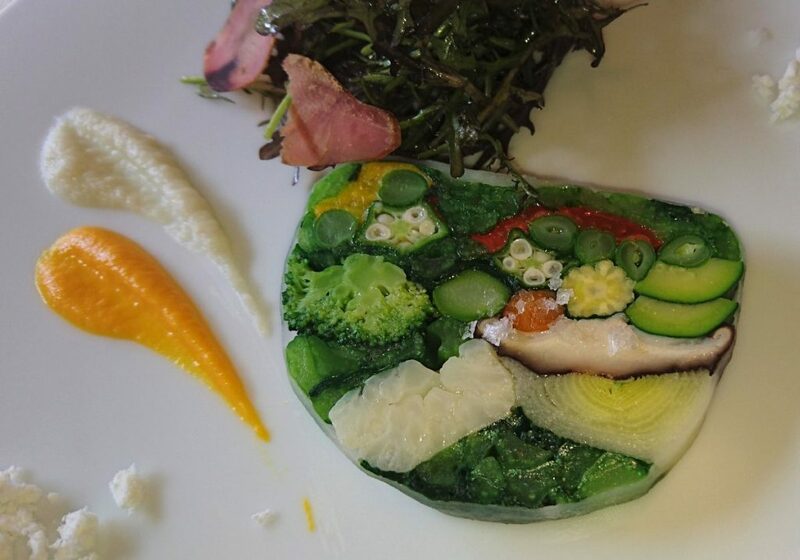 It is a terrine made with different vegetables. My friend and I tried to count how many kinds of vegetables were used in the vegetable art: broccoli; cauliflower; cucumber; okra; haricot bean; spinach; white leek; mushroom; baby corn….. We could not identify all the vegetables, but we were ‘beary’ happy to see this fine artistic entrée. Recently, I sometimes do French-restaurant-hopping. Do you know why? It is to raise my motivation to keep studying French. I would like to say, “I am studying French not just because it is needed in my global work, but because I would like to know more about French culture, lifestyle, etc.” French cuisine artistically presented on the plate always encourages me to keep on going! By the end of the year, I may start writing in French! Ha, ha, ha! Au revoir et à bientôt!